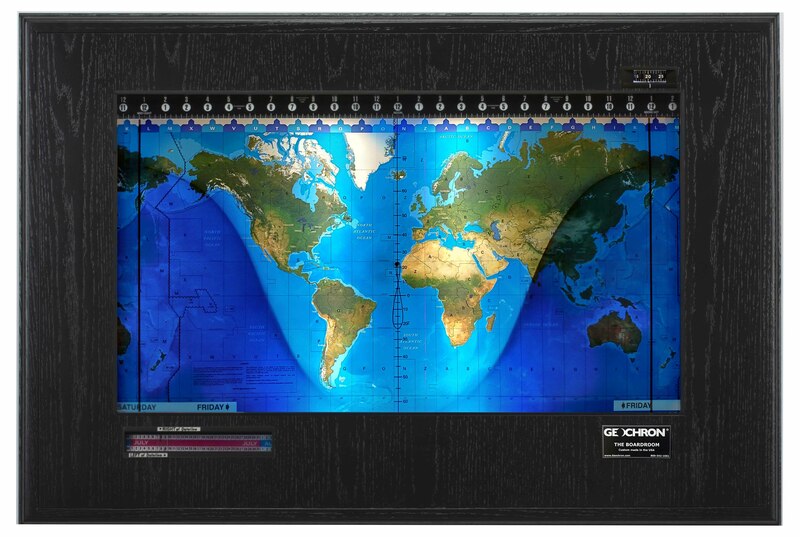 … and before the internet, the Geochron World Clock was the only way to see the Sunrise and Sunset on Earth in real-time, in sync with the Earth’s 23.4 degree axial tilt against the Sun. President Reagan presented as a gift to Mikhail Gorbachev as an example of American Engineering, and these photogenic world clocks have appeared in motion pictures like the The Hunt for Red October. Over 30,000 mechanical Geochrons have been built over the years. From our shop in Portland, Oregon, we alone continue to build and restore these mechanical masterpieces for fine homes and businesses worldwide with enhanced features that were unavailable before 2015. Today, the Geochron Digital 4k takes the terrestrial beauty of our mechanical clocks in to the digital realm in glittering 4k resolution. The digital Geochron is unconstrained by physical gears and assemblies, so it’s much more affordable… constantly evolving with more mapsets, layers, and live data than ever before. A complete rebuild adds a modern drive system and mapsets for a clock that will last another generation. If the Geochron had been invented in 2018, this would be it. Find the actual location of the International Space Station, and much more. The original machine custom built around the mechanical charisma that you remember, but with modern mapsets, lighting systems, and panels. Your smart phone will never look this good. Updated in 2017 to magnetic motors, we’ve created the most reliable Geochron ever made, and reduced power consumption with LED Lighting. Watch the sun rise and fall in real time within seven mapset combinations, and mark the locations that are important to you.